Make Model Kawasaki VN 1700 Vulcan Vaquero S.E. Who says you can’t have a stylish cruiser that is still practical and dependable? 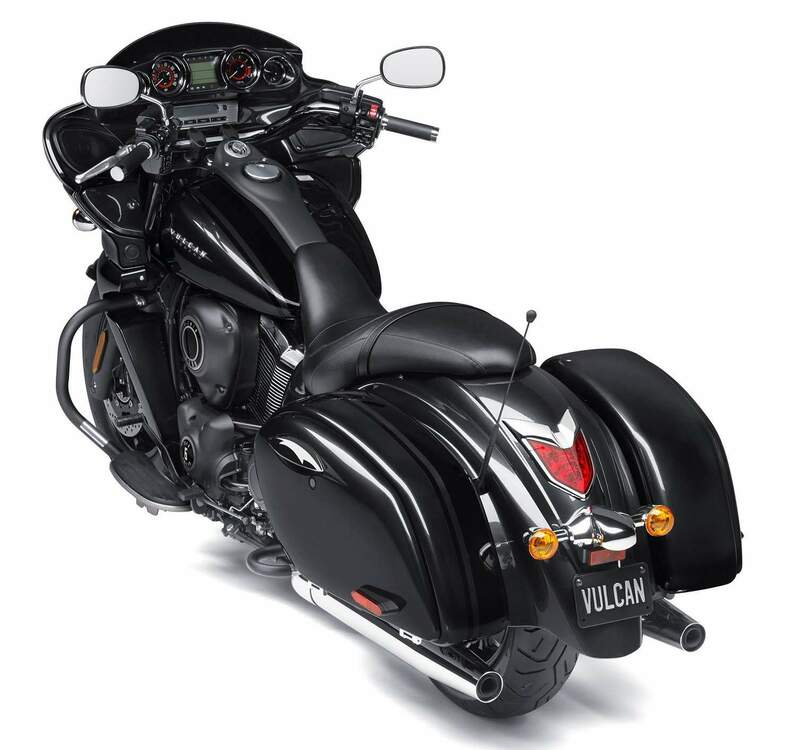 Owners of a Vulcan® 1700 Vaquero® bagger have the best of both worlds. The traffic-stopping good looks will make you smile every time you throw a leg over this beauty. A frame-mounted, abbreviated fairing sets the stage while the elegant tank leads the eye to the shapely rear luggage of this V-twin bagger. The multi-textured, blacked-out engine and chassis treatment has been applied to components (like the air-cleaner cover, wheels, fork assembly and tank cover) that would normally be chromed. This leaves only a special few parts (engine guards, exhaust, mirrors, etc) that receive plating in order to act as bright accents to either the Candy Lime Green or Metallic Carbon Gray paint. 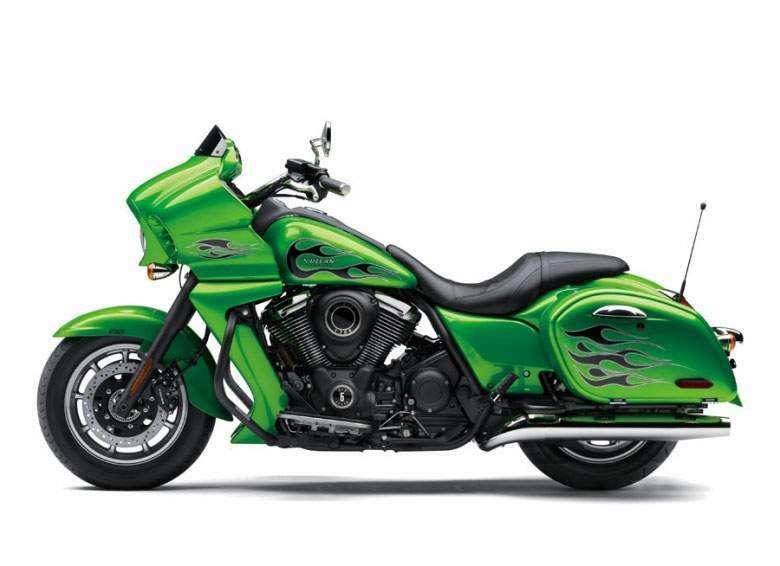 V-twin is tuned to deliver instant power with the twist of the wrist on both the boulevard and the highway—all with Kawasaki’s famed long-term dependability. The impressive list of standard features rounding out the roomy cockpit, like electronic cruise control and a high output audio system, show the Vaquero’s practical approach to racking up big miles. And, when this menacing stranger rolls into town on Friday evening, no one will forget the first time they saw the Kawasaki Vulcan Vaquero. Beneath all that beautiful bodywork, paint and chrome is a superbly engineered motorcycle, one that blends power, handling, a confidence-inspiring character and impressive dependability into a massively functional package. It all starts with the Vaquero’s 1,700cc liquid-cooled V-twin engine. It is a thoroughly proven design, with the 52-degree V-twin boasting the latest engine technology but with styling that indicates a throwback to the past. Features include an overhead camshaft design, high compression and a long-stroke dimensional design that results in the sort of effortless low- and mid-range thrust that’s so desirable and enjoyable in a big-engined cruiser. Vaquero’s throttle valve system works with the advanced Digital Fuel Injection (DFI®) system to optimize engine response without detracting from its distinctive V-twin throb. The system uses an Accelerator Position Sensor (APS) and a Throttle Position Sensor (TPS) that feed data to the ECU. The ECU then adjusts the throttle plates to tailor intake airflow accordingly. The system offers a natural throttle feel, because APS is activated by a throttle body pulley connected to the throttle grip by a cable. Besides the obvious DFI advantages, such as improved fuel economy and automatic adjustment for altitude changes, the system also permits easy hands-off warm-up and idle speed control. Additionally, Vaquero features a water-cooled alternator that produces a staggering 46.8-amps of electrical output – plenty to power a selection of electronic accessories to enhance any road trip. A massive quantity of usable torque spread out over a shockingly wide rpm range is the signature trait of its muscular V-twin. With 108 lb-ft of torque, a mere twist of the Vaquero’s throttle delivers effortless acceleration for freeway passing or spirited riding, and the smooth wave of low-RPM grunt is always ready to turn heads when cruising down the boulevard. 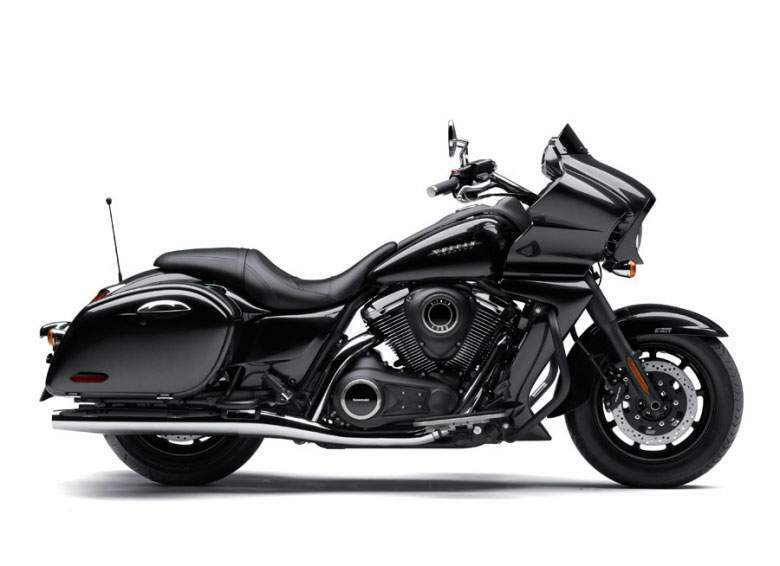 Vaquero offers true touring-bike convenience in the form of its electronic cruise control system, conveniently operated from the right handlebar and usable at any speed between 30 and 85mph in any of the top four gears. The cruise system can be disengaged in any of the following ways: applying the front brake lever, clutch lever, rear brake pedal, or manually turning the throttle grip past the “closed” position. Additional touring ability shines through the engine’s six-speed transmission with overdriven fifth and sixth gears, which contributes to a relaxed ride and excellent fuel economy at highway speeds. Power is routed to the rear wheel via a carbon fiber-reinforced drive belt that has a 40-percent higher tensile strength than current Kevlar belts. And that chopped, custom-look fairing? Although lower than a traditional windshield or full fairing, it still cuts a decent-sized hole in the oncoming airflow, giving the rider a useful still-air cocoon in which to enjoy the ride. The intercom headset-compatible, 40-watt, twin-speaker audio system features navigation audio prompts, a three-band (FM/AM/WX) radio that is also compatible with iPod®, SiriusXM® radio tuner, select GPS devices or a CB radio unit. The audio system (and iPod) can be operated by an integrated controller on the left handlebar. In addition to volume, the rider can also adjust the bass, treble and balance levels of the system. Lockable side-loading hard bags are beautifully integrated and spacious, and styled to highlight the bike’s long, low look. A scooped saddle offers a comfortable rider perch, while a minimalist passenger pad sits atop a smooth-shaped rear fender that integrates equally stylish taillight and turn signal assemblies. The frame holding all this hardware together is a single backbone, double cradle unit designed to be as slim and light as possible for an easy reach to the ground and optimal handling. Bolted to the steering head is a mammoth 45mm fork assembly offering 5.5” of wheel travel and a thoroughly compliant ride. The rear suspension consists of twin air-assisted shocks with rebound damping adjustability plus a spring calibrated for touring and it all works with a beefy steel swingarm. Nine-spoke cast aluminum flat-black wheels hold fat, 130/90 front and 170/70 radial tires that offer light handling characteristics, superb traction and long life. The 1700 Vaquero’s braking hardware consists of dual 300mm front discs with twin-piston calipers and a 300mm rear disc with a two-piston caliper—all linked and enhanced by the Kawasaki Advanced Coactive-braking Technology (K-ACT II) ABS system. K-ACT II uses advanced electronics to translate the rider’s braking inputs from both the front lever and rear pedal into smooth, balanced deceleration and maximum stopping performance. Basically, the front lever also activates the rear brake, and the rear pedal also engages the right front caliper. 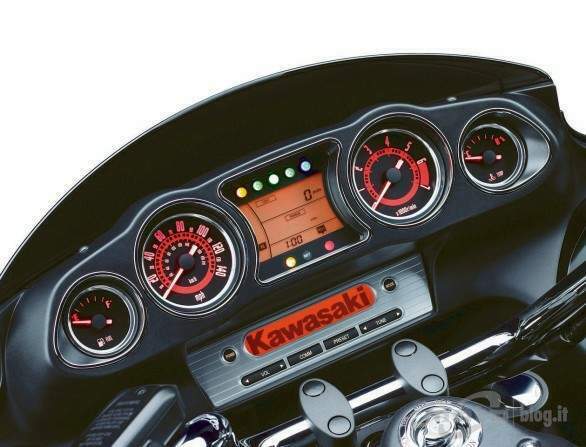 K-ACT II ensures all this happens seamlessly and efficiently, and the second-generation system uses the same smaller, lighter ABS unit and faster, higher-spec brake ECU found on the Kawasaki Concours®14 ABS motorcycle for smooth, precise operation. The K-ACT coactive function does not engage when braking is applied at speeds below 12mph, such as in a parking lot, while the ABS function is automatically disengaged at speeds below 4mph. 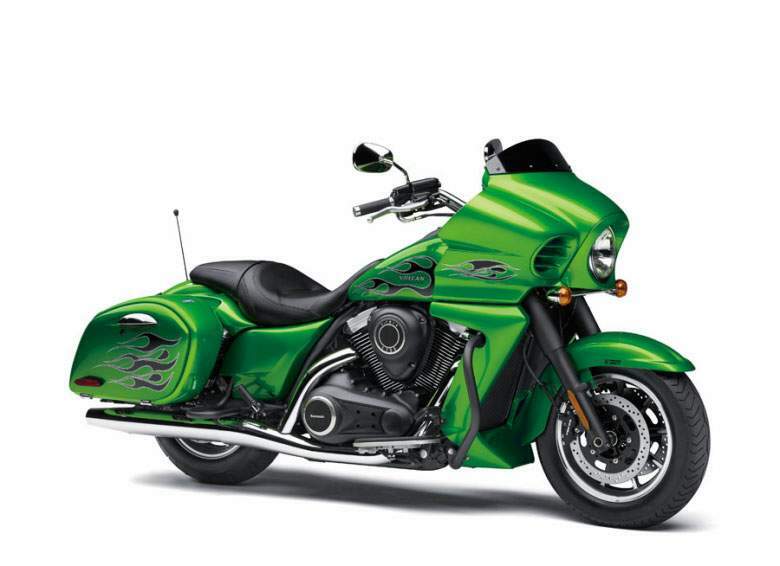 It all adds up to a truly top-of-the-line bagger that encompasses a perfect combination of traits: It’s functional in a wide range of environments, from inner-city cruising to running down the open road. It has highly advanced technology. And it’s astoundingly beautiful, a bike that will put goosebumps on your arms every time you open the garage door.